Great cities incorporate public art into the built environment; Birmingham has lagged others in this regard. 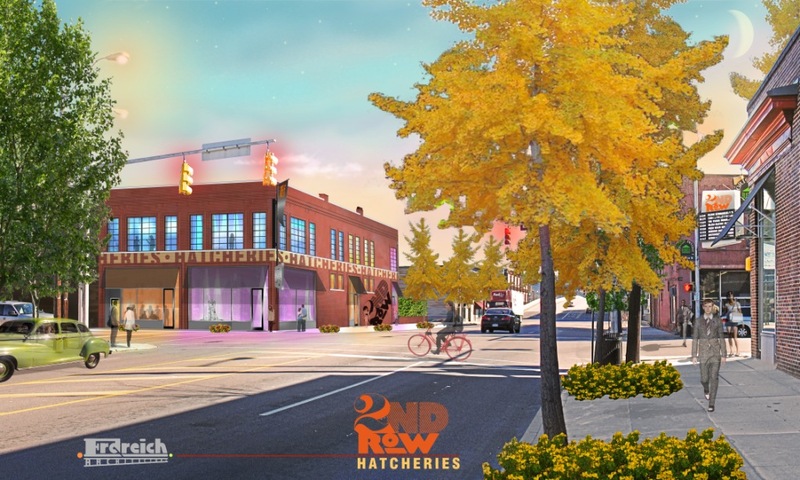 Yesterday at Design Review Committee, the City took a step towards improving the situation with unanimous approval of a mural painting on the East wall of the Lichter’s Building (facing a parking lot fronting 19th Street North between 3rd and 4th Avenues, rendering above). The mural will be in the style of the late artist Andy Warhol, and will feature Vulcan, the symbol of the city. It was especially heartening to see a unanimous approval for such a relatively large, bold artwork. Eight years ago there was push-back on the large painted mural sign we proposed for our 2nd Row development–which was at the time considered audacious for a downtown historic district (a muted dark gray in color, it was ultimately approved; progress photo from 2007 below). Thankfully, the Committee, and the public generally, now better appreciates the role that art, and its cousin good graphic design, can play in helping to revitalize and invigorate urban areas. This post is a little different from usual, but please help me spread the word. We’re renting out a unique downtown space: one-of-a-kind in Birmingham. Live here. Work here. Be part of the diverse neighborhood. Your own private garden. Your own private parking. It’s part loft, part townhouse, with access from both Second Avenue North and the alley — just steps away from fresh coffee brewing at Urban Standard or beer on tap at Pale Eddie’s brings you into about 1500 square feet of flexspace. Currently configured for a residence, with two bedrooms and a gracious double bathroom (with heated floor), this is also an excellent opportunity for a live/work — or even an office. 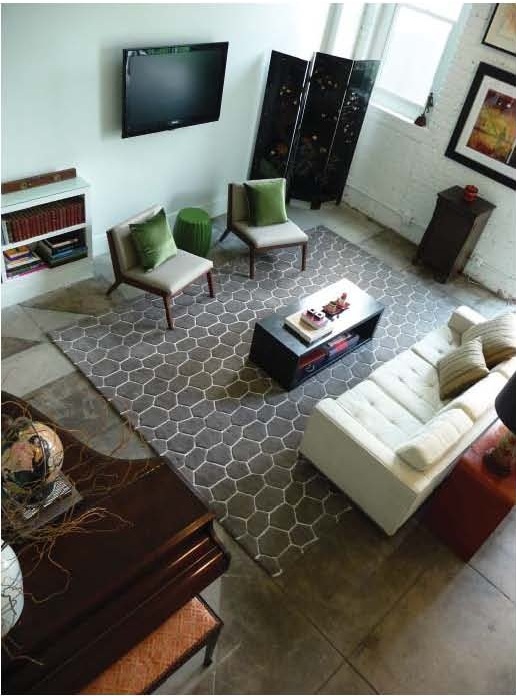 The light filled living room opens onto a rare urban feature for downtown, your own private garden. 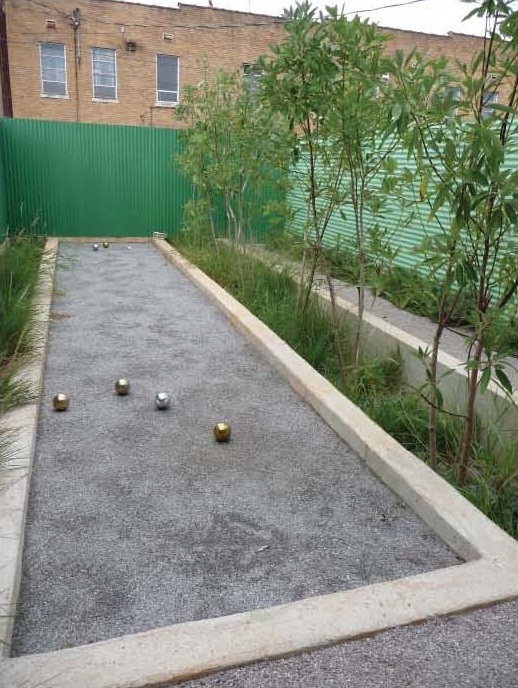 Perfect for garden parties or bocce or just enjoying a quiet slice of outdoor space. 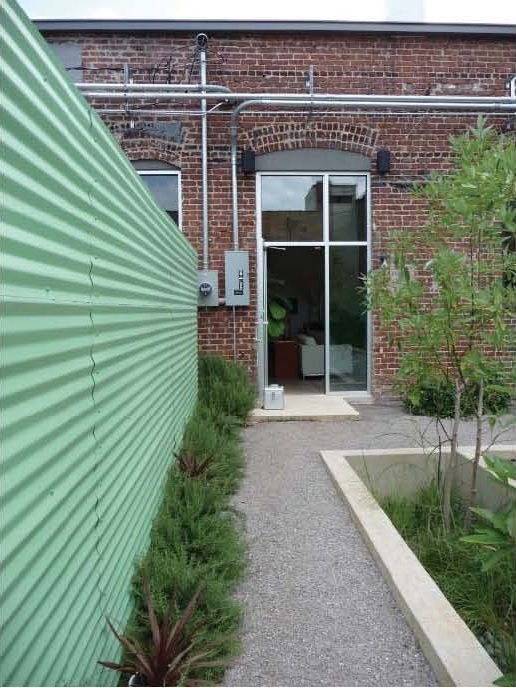 Private parking and alley access are at the rear of the property. 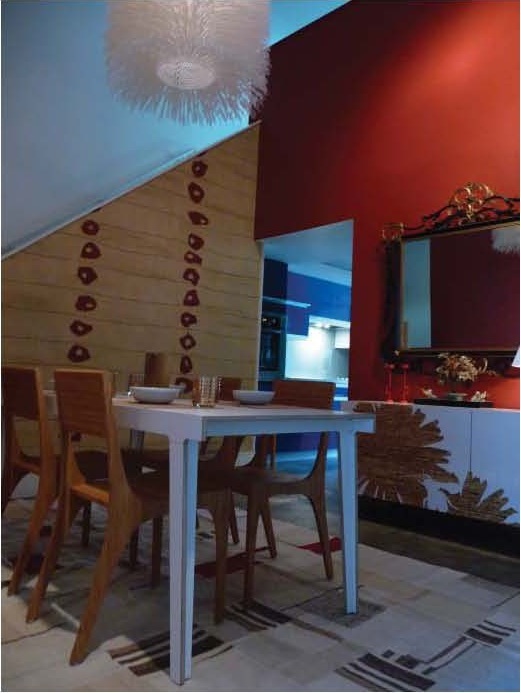 The high ceilings in the current dining area come with an upcycled pendant from Brooklyn, and hand-blocked wallpaper from St. Louis. The adjacent modern kitchen with concrete tops and high-gloss cabinetry has a washer and dryer, five burner Fisher Paykel cooktop, Bosch convection oven, double dish drawer Fisher Paykel dishwasher, and a walk-in pantry. One of the current bedrooms has its own built in office loft and large walk in closet, while the second bedroom on the upper level has double storage closets and is open to the living area below. You might ask, why is this on the blog? It’s my personal condo that I’m putting up for rent to take advantage of other opportunities. When we developed 2nd Row we helped create a new node of activity downtown and it is exciting every day to see the increased traffic on the streets as a result. For more information, please contact Kim Mason at 205.254.0106 or Adrianne Curran at 205.790.2374. The growth of retail establishments downtown has not kept pace with the growth of neighborhood population. Why? In part because populations must reach tipping points before retailers will consider new locations, and for certain businesses our population is just not there yet. However, another reason is that downtown doesn’t have the right available space in the right locations. Take the growing Second Avenue district and the retailer Charm (above), in the 2300 block of Second Avenue between 23rd and 24th Streets. 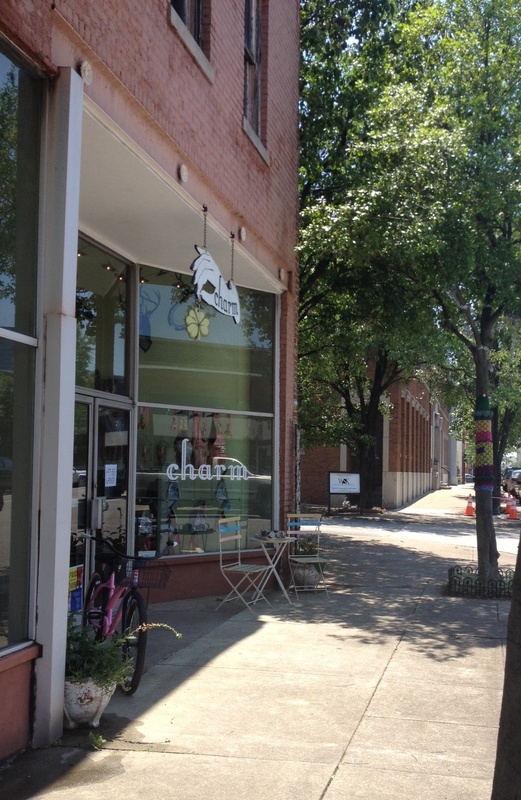 There are bars, a coffee shop, a corner bodega, and a skate shop on the block–all very complementary to Charm’s vibe. What we now need are a couple more retailers to step up and join the district–and indeed several have been searching for small space at reasonable rents. But it’s proven very hard to find. 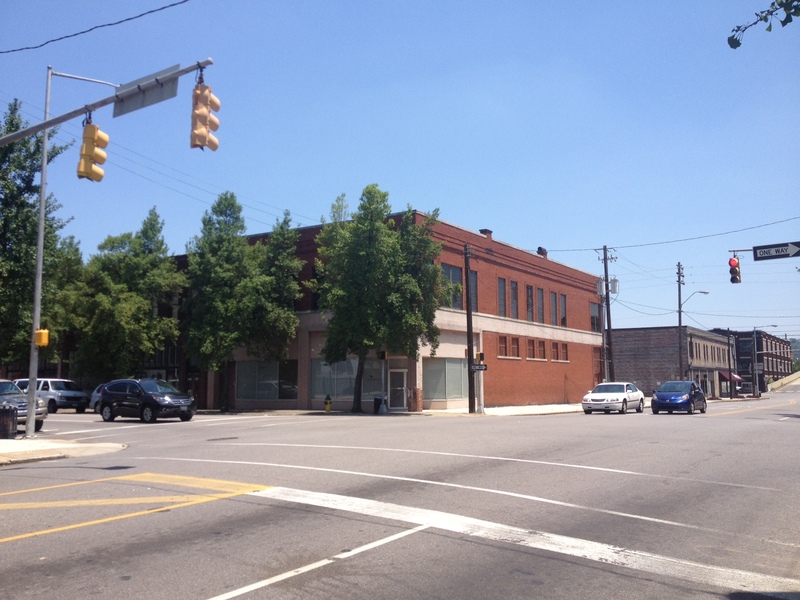 While there is plenty of vacant retail storefront downtown, much of it is too big. If it were subdivided into smaller, reasonably priced spaces it would be easier to fill. Unfortunately many building owners don’t want to go to the expense of speculative renovation for a market that’s still seen as pioneering. Above is the building at the SE corner of 24th and Second Avenue North, right down the street from Charm. 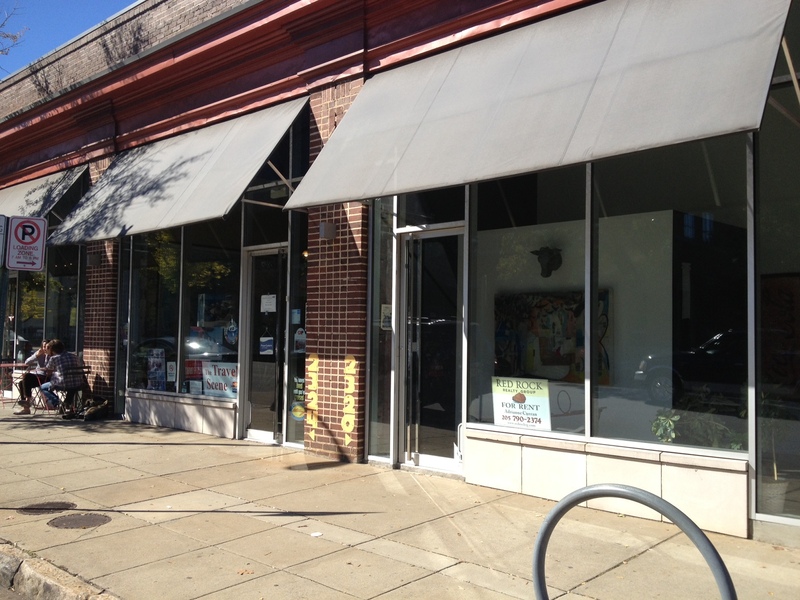 Most recently professional offices, it was bought last year and is seemingly vacant: it’s storefront blinds are drawn, and no renovation work evident. It’s a big blank non-contributing element to the district right now. Last year we worked on a concept project with the previous owner (above) that would have created smaller retail storefront spaces on the first floor, and updated the building with a clean, graphic aesthetic complementing our 2nd Row project of 2007. If this city had a Redevelopment Authority, perhaps it could’ve identified this property as key to the growth of the Second Avenue district, bought or leased the space, performed the necessary renovations, and then marketed it to retail and restaurants. We have nothing like that here, which inhibits our getting traction or critical mass again and again (although Main Street Birmingham has had some success with similar ventures in the commercial centers of Woodlawn and Avondale). 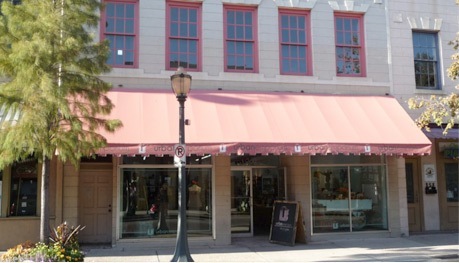 Once again, the smaller city of Mobile to our south is ahead of the curve: the Downtown Mobile Alliance (equivalent to our Operation New Birmingham) has acquired a spacious former retail space on Dauphin Street downtown (above) and created the Urban Emporium. Here, start-up retailers can rent small spaces with shared overhead, checkout, etc.–a retail incubator, if you will. 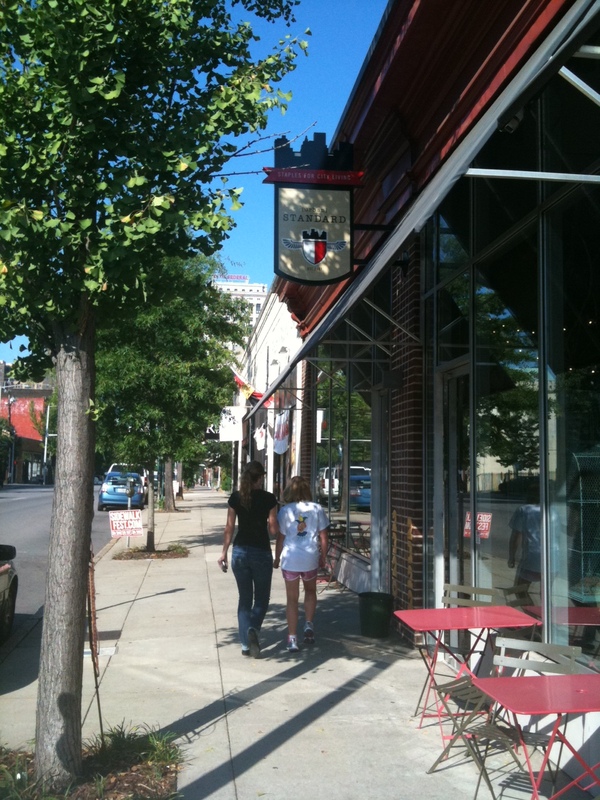 It allows retailers interested in downtown to introduce themselves to the neighborhood at minimal expense. The idea is they grow a customer base, and then graduate to their own space elsewhere downtown. Birmingham needs to do something similar. Otherwise, we’ll keep losing opportunities like our aborted project above, while eager but frustrated entrepreneurs keep searching. Their search may lead to other neighborhoods altogether if we don’t have a plan in place to accommodate them. Critical mass is typically a combination of the organic and the planned. Here on Second Avenue North the organic has come a good ways. It’s time for some planning to keep it going. More on that next post. As reported in the last post, the Design Review Committee refused to vote on the proposed projecting sign advertising the new El Barrio restaurant in the 2200 block of Second Avenue North (sketch shown above). The Committee has been gradually giving more support over the last 10 years to projecting signs, which became symbolic in the 1970’s and early 80’s of urban “blight” and “messiness”. Back then, urban planners and designers tried to eliminate this type of projecting “blade” sign, and replaced them with surface mounted signage which mimicked retail signage you’d find in enclosed suburban malls–a fashionable paradigm at the time. 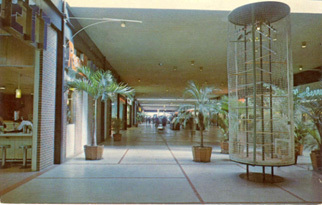 This suburban paradigm (illustrated above in a 1960’s photo at the original Eastwood Mall in Birmingham) was a product of strict control: malls are private enterprises, and signage along with other aesthetics had to conform to specific guidelines. Color, size, illumination, font, and verbiage were all subject to approval. This was different from the situation in older urban cores, where a lack of control over multiple ownerships resulted in a great diversity of signage. 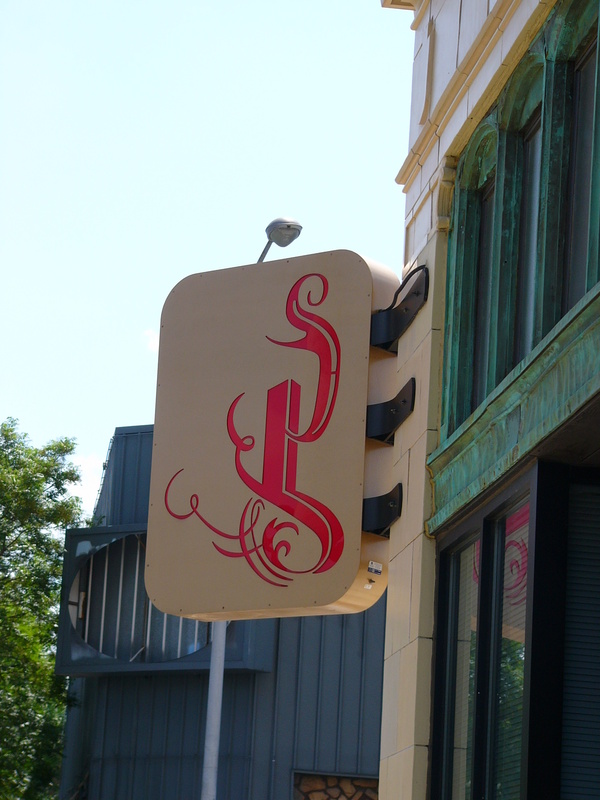 Historically, projecting signs to draw attention to businesses were a fundamental part of the visual landscape. Even mundane signage (like that above in a narrow Parisian street) enlivens the pedestrian route down a street, alerting you that “something of interest” lies ahead. It also acts as a traffic calming device, making drivers slow down a bit as their peripheral vision takes in the signage around them. 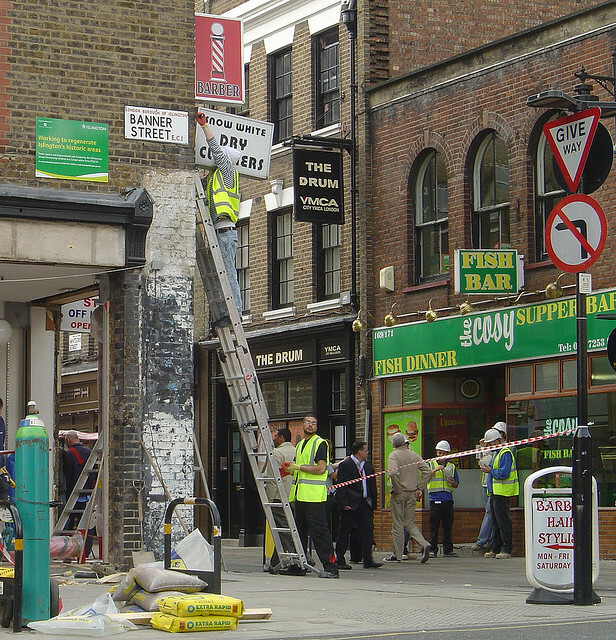 More functional signage is seen at this London intersection above. Imagine this same scene without the projecting signs, and some of the charm disappears. 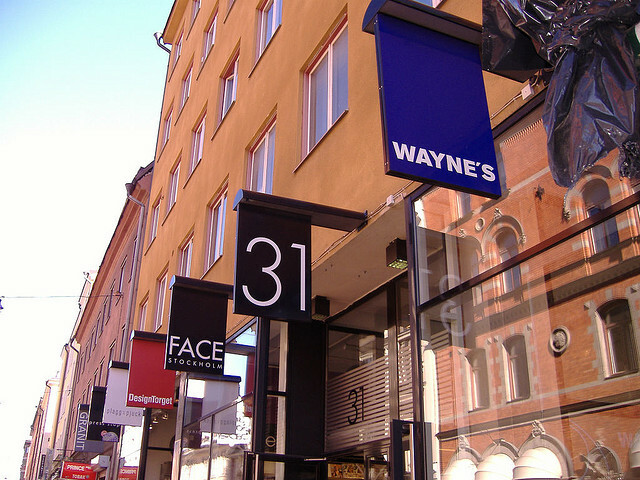 Above is a development in downtown Stockholm, where the developer insisted that all retail tenants have well-designed projecting signs, which share a size and good graphics, but otherwise are distinct and eye-catching. 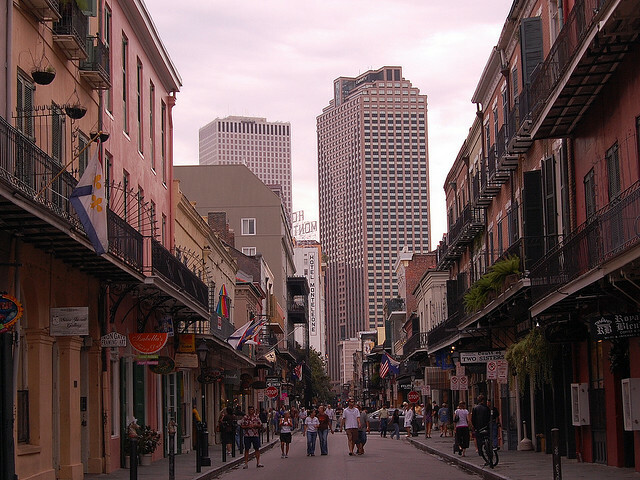 Closer to home, another historic street is Royal Street in New Orleans, whose proliferation of signage is part of a recognizable fabric–and one beloved by many. Historic districts like this today encourage–even mandate–the use of tasteful, well-designed projecting signs because their value as an intrinsic part of the street experience is appreciated, and has been (explicitly) for years now. 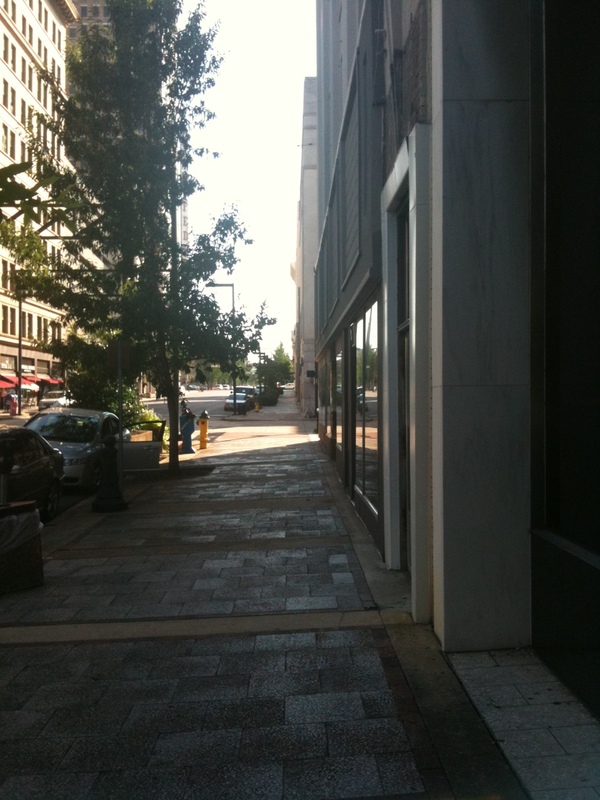 Contrast the vibrancy of the previous photos with the above image of 2nd Avenue North in downtown Birmingham, looking east from 20th Street. The lack of projecting signs (or awnings, or cafe tables) makes for a lifeless, dull, less-than-enticing prospect. 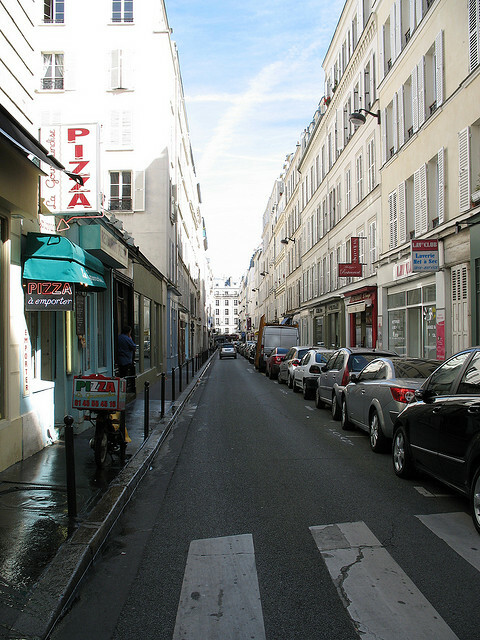 Unless you are very familiar with the street and know where you are going, what stimulates you to explore? Not much. A lot of this is the result of Birmingham traditionally making it difficult, since the late 1970’s, to erect projecting signs. Fortunately, as mentioned earlier, Design Review has been a bit more supportive each year in the last decade of approving projecting signs, to the point where–much to my relief–I’ve grown to count on them for approving projecting signs, as long as they’re thoughtful and tasteful (above is the projecting sign we designed for the Phoenix Building loft project back in 2005, which provides a welcome bit of light and whimsy on an otherwise distressed piece of street–note the ruined sign box across the street which has been in that condition for a decade). This is why I was quite surprised that the relatively small, non-illuminated sign for El Barrio received a lot of criticism, using as a reference point an early 1980’s argument about sanitizing the streetscape. It felt like a time warp. 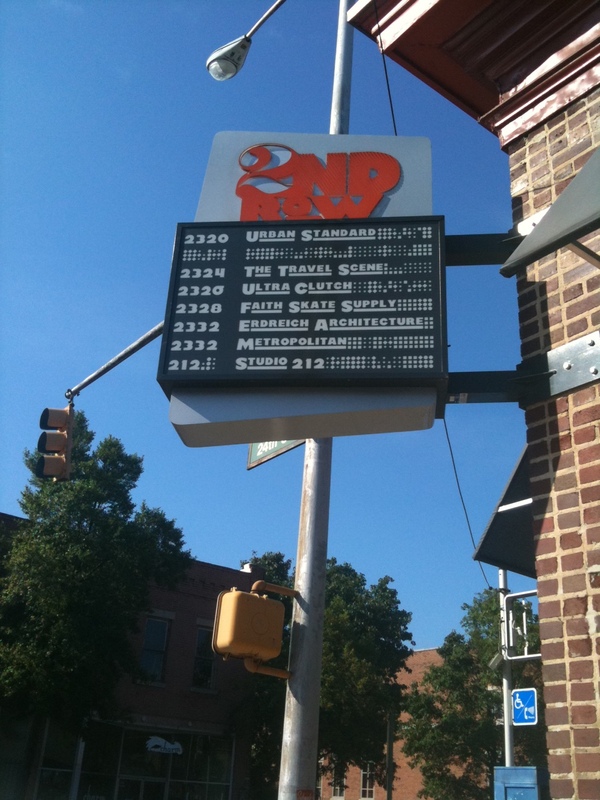 A recent approval for a projecting sign was for Urban Standard, just a block down the street from El Barrio (above). This popular coffee shop wanted to clearly show pedestrian and auto traffic where their business is, and this sign works well. The busier this block has become, the less likely people park in front of a business–they often walk from some distance, or park on another block. Projecting signs are an excellent way to orient visitors and residents alike. I have personally witnessed visitors to this block with Urban Standard hesitate before crossing to the next block–they squint, looking, literally, for a sign of interest: is it worth our while to keep walking? To connect El Barrio with the energy of 2nd Row, people need that visual connection. The sign needs to be approved. Projecting signs (the 2nd Row sign we designed in 2007 is above) are crucial to any healthy urban street environment. They can be expensive, and time-consuming to install (the City legal department has made it more difficult to get the final permit for anything projecting over a public way, beyond approval of Zoning or Design Review). If a business owner is willing to put time and money into a well-designed sign, we should be encouraging them to do so to enhance our built environment, rather than discouraging them by using outdated, suburban-inspired principles from 40 years ago. I hope the applicant will make another case for the sign, and get approved next time. To anyone interested in improving this town, it’s a no-brainer.